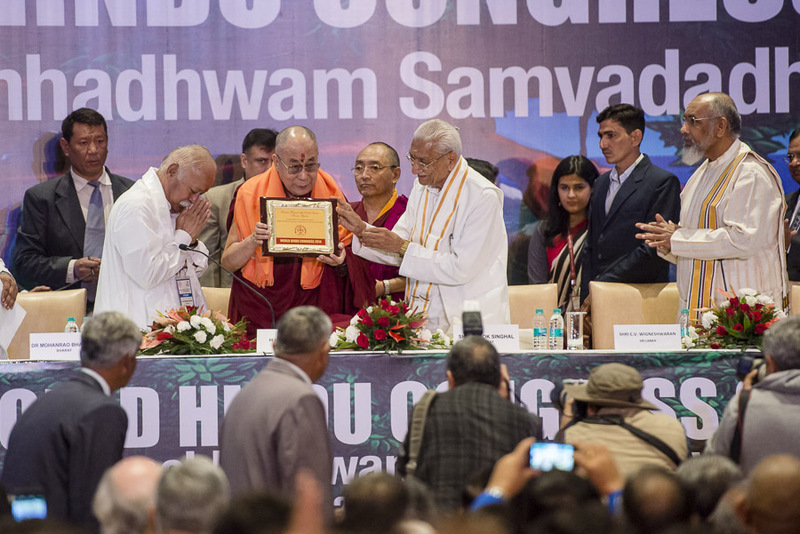 (TibetanReview.net, Nov23, 2014) – Tibet’s exiled spiritual leader, the Dalai Lama, was on Nov 21 honoured by a global Hindu congress in India’s capital New Delhi. The occasion was the inaugural function of the First World Hindu Congress (WHC) to which he was a chief guest, along with RSS chief Mohanrao Bhagwat and VHP patron Ashok Singhal. The Dalai Lama was honoured along with Pujya Swami Dayanand Sarasvati and Ashok Singhal. The citation of the honour described the Dalai Lama as a manifestation of Avalokiteshvara, the Bodhisattva of Compassion, as someone who has already been awarded the Nobel Peace Prize and the Magaysay Award, who has established schools, monasteries and institutions such as the Library of Tibetan Works & Archives and who has propagated the Dharma of truth and compassion. 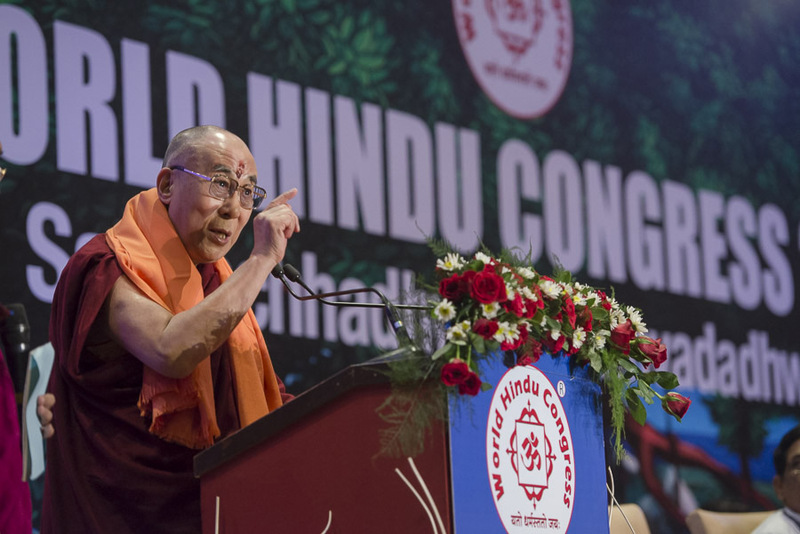 In his address to the gathering of 1800 delegates from 50 countries, the Dalai Lama spoke of Buddhism and Hinduism as being like spiritual brothers. He reiterated that all major religious traditions teach compassion, forgiveness and self-discipline. He added that the goal of all the different religious traditions was to benefit humanity. He remarked that despite philosophical differences between them, he viewed all major religious traditions as being conducive to peace of mind. “We are all equal. Born the same way. Sometimes we forget the sameness of humanity and talk of divisions. In terms of we and they… We need sense of oneness among seven billion people of the world,” timesofindia.indiatimes.com Nov 22 quoted him as saying. It said he pointed out how all wars and violence are created by man and “unfortunately religious faith also causes problems”. The congress will continue till Nov 23. It is being organized with support from RSS (Rashtriya Sevak Sangh) and VHP (Vishwa Hindu Parishad). The former is a grassroots national voluntary service organization with millions of members while the latter is a Hindu religious group. The WHC website says the conference is being organized with the objective of bringing together Hindus at a time “when the community is beset by very serious challenges and is standing at a critical crossroad”. Bhagwat was reported to have described a Hindu as a “human being who sees unity in every diversity”. The congress will continue till Nov 23.